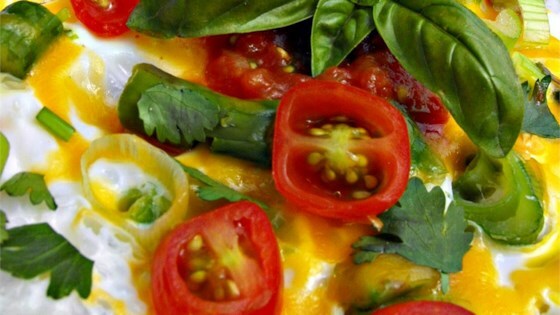 "This omelet is great at any time of the year, but reminds me most of spring. Serve with toast or a bagel." Heat the olive oil in a large skillet over medium-high heat. Add the asparagus, mushrooms and onions; cook and stir until the asparagus is fairly soft, about 4 minutes. Whisk together the eggs and milk in a small bowl; pour over the sauteed vegetables and reduce the heat to medium. While the omelet cooks, lift the edge to allow the uncooked egg to flow underneath. When most of the egg is cooked, sprinkle Parmesan cheese over the top. Allow the cheese to melt slightly, then fold in half and serve. This is not the recipe for the dish shown in the post! The one I wanted was for an omelet with fresh spinach and tomatoes. The recipe shown is one with mushrooms and asparagus. Very tasty recipe. A 1/4 cup of milk for 2 eggs is a little much though, it made the omlette very soft and a bit difficult to handle. Excellent! Had to use sweet onion and added sweet red pepper, Family was moaning and groaning wanting more! I only added ~1T of milk. Subbed tomatoes for mushrooms, regular yellow onion for green onion, used parmesan and sharp cheddar.